Please fill in the short form below with your question, either about the Simrad Maris ECDIS900 MK5, or for some technical advice. Please include details of your vessel if you feel they will help us answer your query. The Simrad MARIS ECDIS900 MK5 is an IMO-type approved navigation system, designed for use aboard SOLAS vessels subject to ECDIS carriage mandates such as merchant cargo ships and tankers. Easy to use with a standard Windows PC interface, the ECDIS900 delivers precise navigation with comprehensive route planning and optimisation tools, integrated chart management and ordering, radar overlay, and optional highly customisable conning display. The Simrad MARIS ECDIS900 is IMO type approved/IEC61174:2008 Ed3 compliant for use on all SOLAS ships and other vessels that must carry an Electronic Chart Display and Information System under the ECDIS Carriage Mandate. 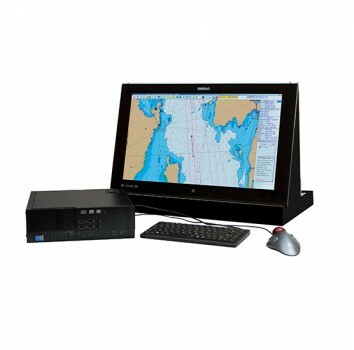 The ECDIS900 MK5 includes a standard Windows PC and separate 24- or 26-inch flat panel monitor suitable for pedestal, table or flush-mount installation. The compact MK5 PC supports horizontal or vertical mounting with an included bracket, or mounting within the optional ECDIS900 pedestal for a freestanding installation. The ECDIS900 offers powerful route planning tools, with integrated Voyage Decision Support (VDS) for route optimisation. Voyage Decision Support assists navigators in selecting a route most likely to provide an on-time arrival, avoid poor weather conditions, and optimise fuel consumption. Taking into consideration detailed ship information and both current and forecasted weather, VDS evaluates multiple route options and highlights the risks and benefits of each. The user may then select and begin navigation of the preferred route. Radar overlay is available with the optional Simrad MARIS PC Radar Kit, which provides a hardware and software interface for third-party radar systems to be used with the ECDIS900. The ECDIS900 supports official Electronic Navigational Charts (ENCs) from PRIMAR, IC-ENC, and ADMIRALTY Vector Chart Service (AVCS); Raster Navigational Charts (RNCs) from ADMIRALTY Raster Chart Service (ARCS); and private vector charts from Jeppesen Professional+. The MARIS Bridge Assistant software may be installed on the ECDIS900, or on a separate network-connected PC. MBA requires a shipboard internet connection to operate. No specialised hardware is required to enable PLECDIS: individual ECDIS900 units are linked together by standard Ethernet (LAN) cables and an approved Ethernet switch. Conning Display software, available as an add-on package, runs on the ECDIS900 PC and is displayed on the main ECDIS screen or an optional secondary monitor. 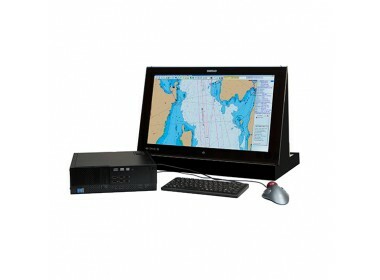 The ECDIS900 conning display may be configured to include pages for navigation, docking, or other specific tasks; all pages are completely user customisable, with a built-in graphical editor and a catalogue of virtual instruments designed to display data from connected sensors in a range of common formats.